To use a sunvisor for a side window (if equipped), pull it downward, unsnap it from the bracket and swing it to the side. 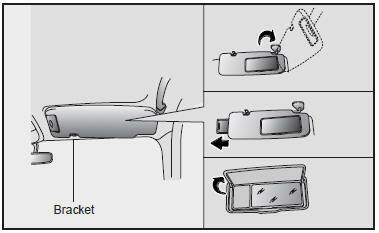 There is a pocket on the driver’s visor for items such as tickets or notes, and a vanity mirror is provided on the passenger’s visor. Both the driver and passenger sunvisor provide important information about your vehicle’s air bag system and about vehicle handling and usage.